Dan Akerson on GM's next CEO: "I think we have more than one and less than six" possible internal successors. "We are lucky." DETROIT (Bloomberg) -- Dan Akerson, who became CEO at General Motors Co. in 2010, gives himself a "B" for his performance so far. He has too much work to do to think about retiring for at least another year or two, he said. GM's accomplishments on Akerson's watch include surpassing Toyota Motor Corp. as the world's top-selling automaker and posting a record $9.19 billion profit last year. Still, the company needs to boost profits, develop more world-class vehicles and build on its "fortress" balance sheet, Akerson said. He also wants to build Chevrolet and Cadillac into global brands and make money in all regions of the world. Akerson, 63, may even give up the top position in vehicles sold if it means becoming the industry's most profitable carmaker. That would bolster the stock price, which has dropped 35 percent since GM's November 2010 initial public offering. "I'd rather be No. 1 in profitability in terms of either aggregate or margins, and we're not," Akerson said in an interview at Bloomberg headquarters in New York. "When I was in school, I wasn't satisfied with a B." He still isn't satisfied with good. A U.S. Navy veteran who spent two decades in telecom and one in private equity, he's still adjusting to the complexity and long-range product planning of the auto industry. He's determined to position GM to excel for years to come. 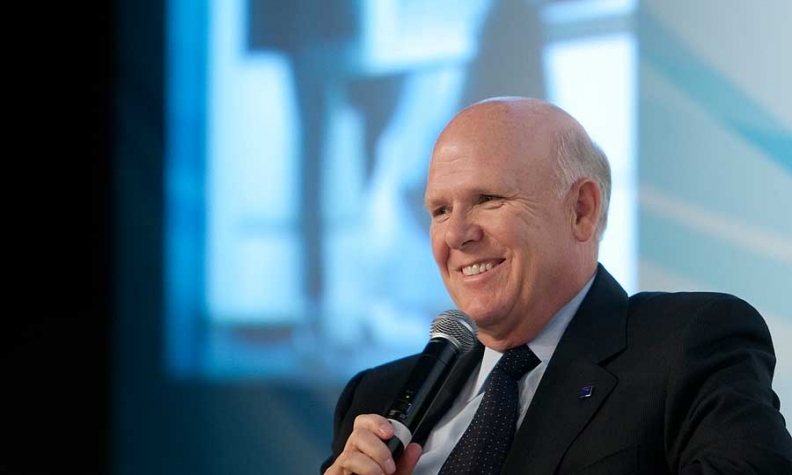 Akerson joined the board when GM exited bankruptcy in 2009 and became CEO in time to lead the "grueling" IPO road show. David Cole, chairman emeritus for the Center for Automotive Researcher in Ann Arbor, said a "B" is an appropriate grade for Akerson's performance so far. "He's making good progress," Cole said in an interview. "He's learning." An early misstep for Akerson was setting overly ambitious sales targets for the Chevrolet Volt plug-in hybrid, Cole said. "He's impatient," Cole said. "I think he pushes. I wish he was a little bit more like a coach rather than a king and that, I think, is something that could hurt him down the road in getting the full set of leaders in the company behind him." Akerson, who abhors the "consensus culture" of old GM, acknowledged that he doesn't like to wait. "My mother, God rest her soul, used to say, 'Dan, you're a fine young man but there's one virtue that didn't pan out well for you and that's patience,"' he said. Akerson is trying to be patient now about the things that are out of his hands, including GM's credit rating, stock price and government ownership. The U.S. Treasury Department sold 28 percent of GM at $33 a share in a 2010 initial public offering and still holds 32 percent of the outstanding common stock, acquired in the $50 billion bailout by the Obama administration. The U.S. wants to sell its remaining stake for at least the IPO price, people familiar with the matter have said. The share price would have to rise 54 percent from Tuesday's closing price of $21.42 to reach that level. Akerson said he hasn't discussed with the government when it may sell its shares. Warren Buffett's Berkshire Hathaway Inc. disclosed Tuesday that it had bought 10 million shares of GM, making it the company's 20th largest investor. GM's credit ratings fell from investment-grade status in 2005. The company is now rated at the highest speculative-grade level by Moody's Investors Service and Standard & Poor's. "We are back, we're healthy, we're restructured," Akerson said. "We have a cost structure that now is appropriate to the demand in the marketplace." Within the next three years, 70 percent of GM's product portfolio will be replaced, Akerson said. He also wants to increase GM's adjusted margins -- 5.8 percent in the first quarter -- noting that "world class" margins are 8 percent to 10 percent. Part of what's holding the company back is GM's business in Europe, where it lost $16.4 billion since 1999. Akerson was part of the GM board that decided against selling the company's German-based Opel unit in 2009, and the automaker appeared poised to break even last year until November as Europe' economy worsened. "If Opel were breaking even this year, we would jump to almost just over 7," he said. Volkswagen AG was the most profitable company in the industry last year, with $21.5 billion in net income. Akerson is also facing greater competition from Toyota as its production improves compared to last year when an earthquake and tsunami in Japan cut off suppliers and limited production. Toyota's global sales rose 18 percent in the first quarter to 2.49 million, topping GM's 2.28 million. While Toyota wants to more than double profit this year, Akerson said it isn't coming at GM's expense. "It hasn't been so far," he said. "But it sure could be; it's something we've got to watch." He knows Toyota's strengths firsthand. Akerson told a story about the early years of his marriage, when his wife, Karin, had such a bad experience with a Chevy salesman that they left the dealership and bought a Japanese car. "We were going to buy a Chevrolet, and the guy called her 'the little woman,'" he recalled. "She got so angry, she was almost in tears and said, 'I'm not buying a car at this place.' It was the first Toyota I bought." GM has changed since those days, he said. It's changed even since it emerged from bankruptcy. "We're a different GM than we were three years ago, and we're not going to be bowled over, not by anyone," he said. "We're going to fight; we're going to fight hard for our position." Akerson now drives a Volt, the electric-drive car rated at the equivalent of 94 mpg. He said he's put 3,000 miles on it and used only 1 gallon of gasoline. The model, which starts at $39,145 and qualifies for a $7,500 tax credit, isn't selling as well as Akerson had sought. His goal was to sell 45,000 this year in the U.S., where and dealers have sold 5,377 through four months. Demonized by some Republicans as an Obama initiative, the Volt had become a political punching bag, he said. Akerson said he would just as soon keep his car and himself out of the national debate. "I don't want to be a lightning rod," he said. "I don't want to be in the political dialogue. I have a job to do and I would do it with the same effort and same zeal whether there were a Republican or Democrat in the White House." The U.S. economy has bolstered GM's fortunes. Akerson said he's "guardedly optimistic" about the economy, though the recovery is "fragile." Akerson's most lasting influence on GM may come from choosing a successor. He said there are several promising internal candidates and his preference is to pick an insider because it's less disruptive. "I think we have more than one and less than six" possible internal successors, he said this week. "We are lucky." Still, grooming a successor isn't his top priority this year, he said. His most pressing issues are developing great cars and trucks, and keeping pushing profits up. "I don't know what the measure of my success or failure will be, but if this is a healthy, robust company when I leave, and the stock's at 22, I'll still be proud of my contribution," he said. "I hope it's 32 or 42. I think it could be if we are able to execute as well as I hope. And I hope I will be able to give myself an A."